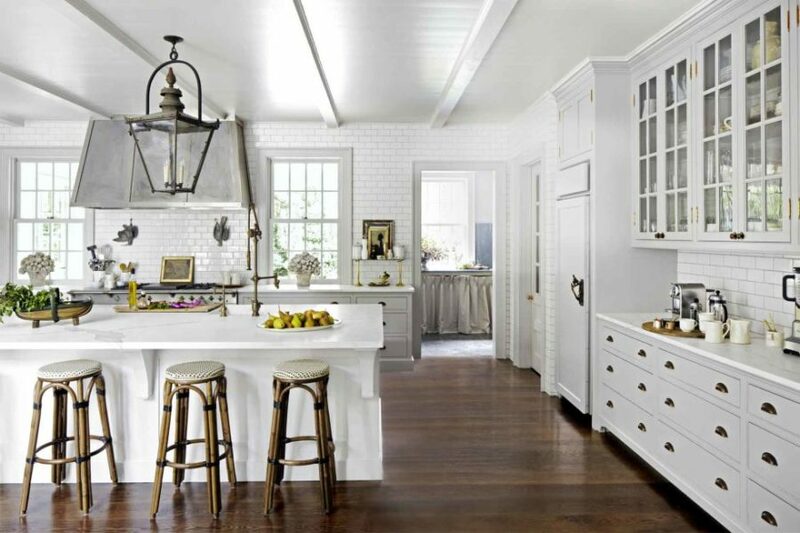 Year after year for almost a decade or so we have all seen the white kitchen dominate the home décor trends. 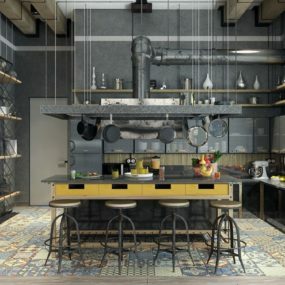 Although, it still remains to be a top competitor in the home kitchen décor department, we are beginning to notice new trends that have reawakened our love for kitchen designs. Different shades of gray are perfect to incorporate more color into your kitchen. 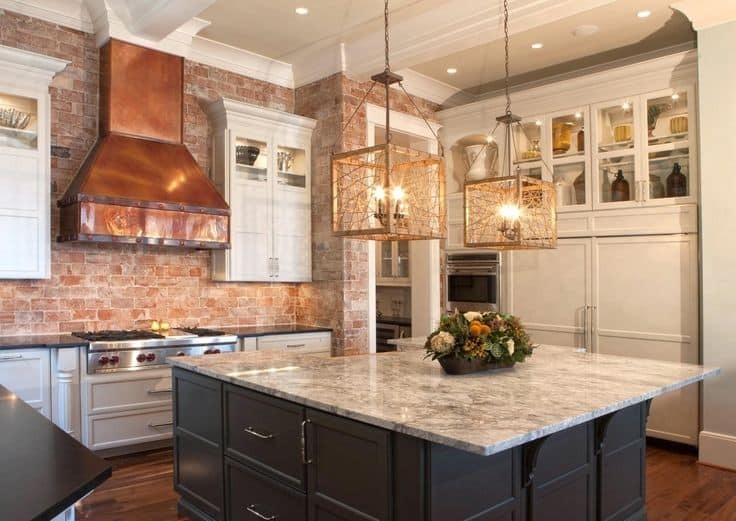 Metal tones in different areas of your kitchen will give you a warm, yet vintage appeal. 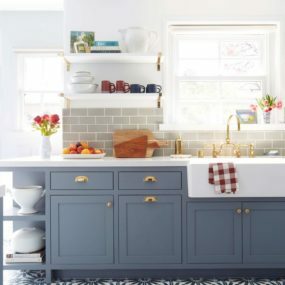 Match your cabinets with your bold floors for a unique pairing. Pecky Cypress wood can be use anywhere around your kitchen. 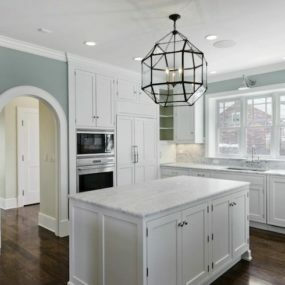 If you are looking, for a kitchen design that is more welcoming, inviting, and more personal than our picks on the best kitchen design trends are sure to inspire your next kitchen makeover. Wooden accents can help open an entire room up. 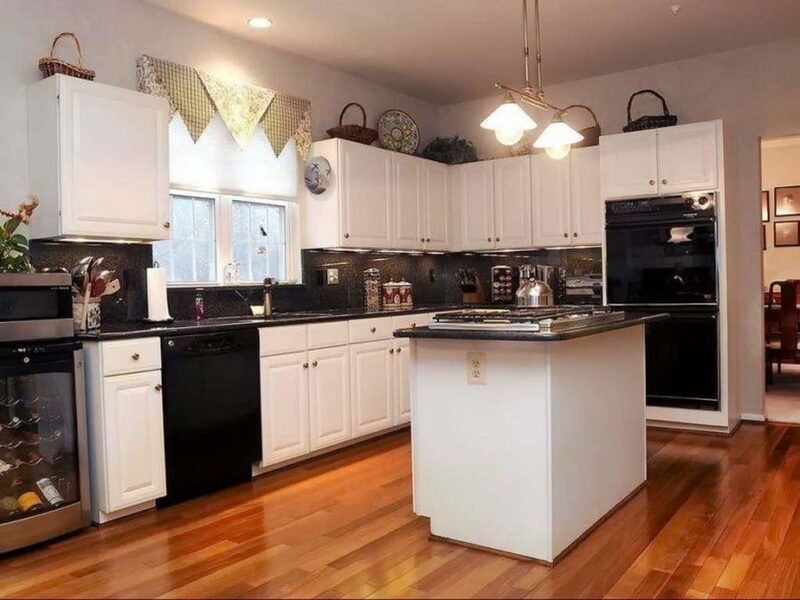 If you choose to have light colors on the wall and on your cabinets, you may want to give the kitchen a more welcoming feel by having dark wood floors. 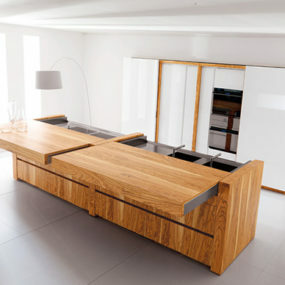 Wooden floors give the kitchen a warmth that can only be achieved with warmer wooden tones. 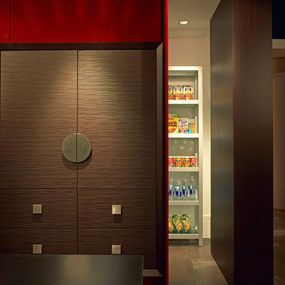 The dark wood allows the kitchen to appear more open and spacious. Although, light tones give your kitchen the appearance of a crisp and clean environment with a hint of timeless. 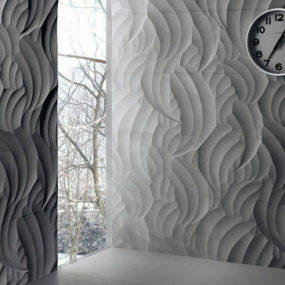 We love the trend of using darker tones such as dark gray, or blues, even a blue gray tone that is very much on trend. The metallic trend isn’t going anywhere anytime soon. We are still loving metallic nails, clothing items and now kitchen pieces as well. The open shelving trend is a great excuse to give in to having metallic pieces in your kitchen space. In a kitchen, the cabinetry hood is the centerpiece. Therefore, it should be treated as such. 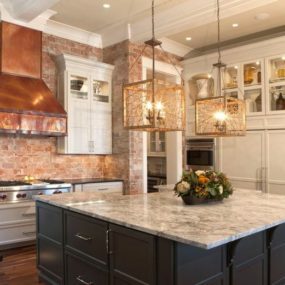 Adding copper sheeting to the hood will add a pop of metal trend while giving it age old warmth and beauty. If you are not entirely sold on having dark wooden floors, consider having statement floor tiles instead. 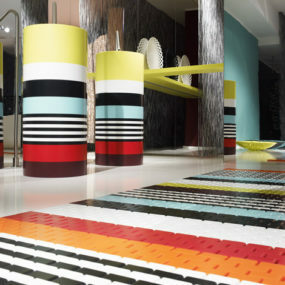 In a kitchen, it is not practical to have rugs to give a touch of boldness. However, statement floor titles can make a huge difference in the appearance of your kitchen. 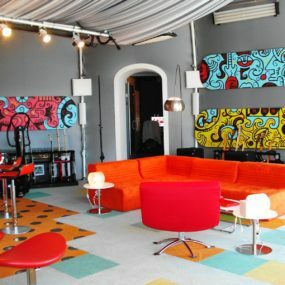 Consider them the easy way of incorporating color without needing to over-do it. 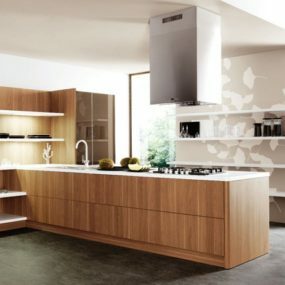 If you have completely fallen in love with having visible wood in your kitchen, we have the perfect kitchen trend for you. 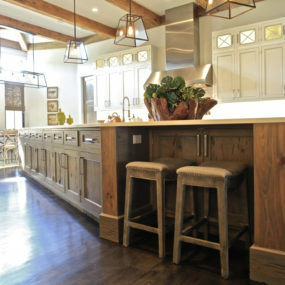 The answer to your wood love in the kitchen is called pecky cypress. 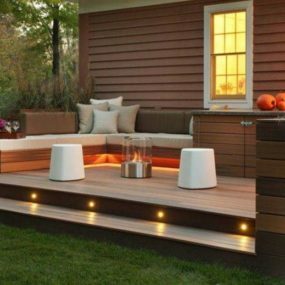 Pecky cypress is the type of wood that has a grainy texture due to its narrow cavities. 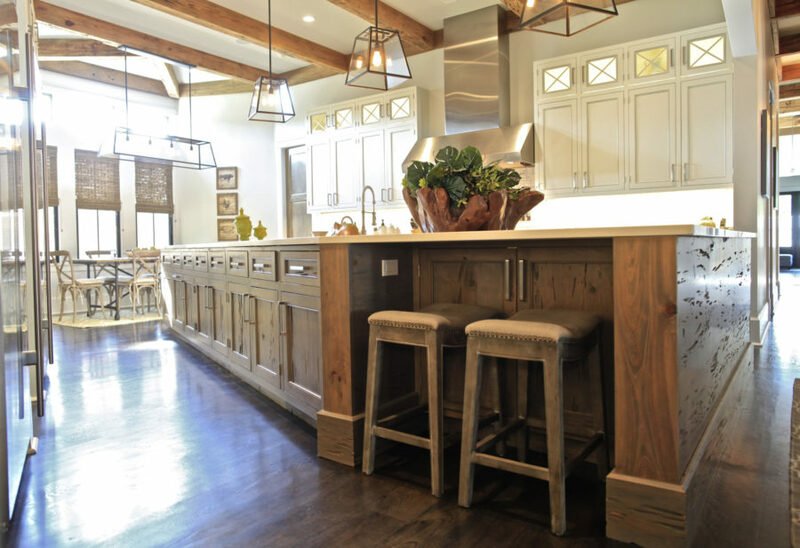 Indulge on this trend everywhere in your kitchen from bar stools to counter tops. 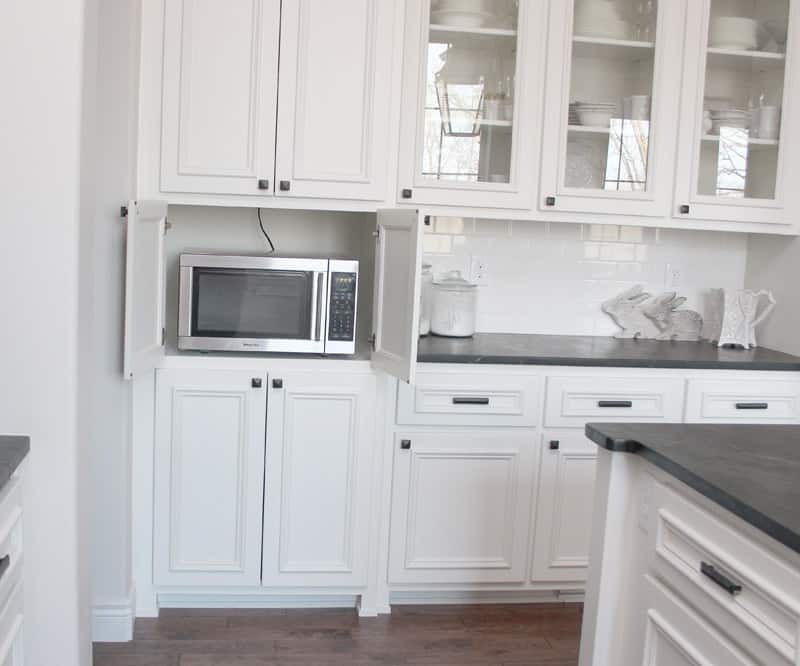 Hiding your appliances opens up more space for your kitchen. Most of us are used to having our beloved appliances out in the open so we can use them time and time again when needed. This kitchen trend tells us to hide them and make the kitchen appear less cluttered. Let’s face it counter tops can become very cluttered with all the things we might use. Therefore, hiding them will give us an open space feel. For a while, we have only embraced silver appliances. 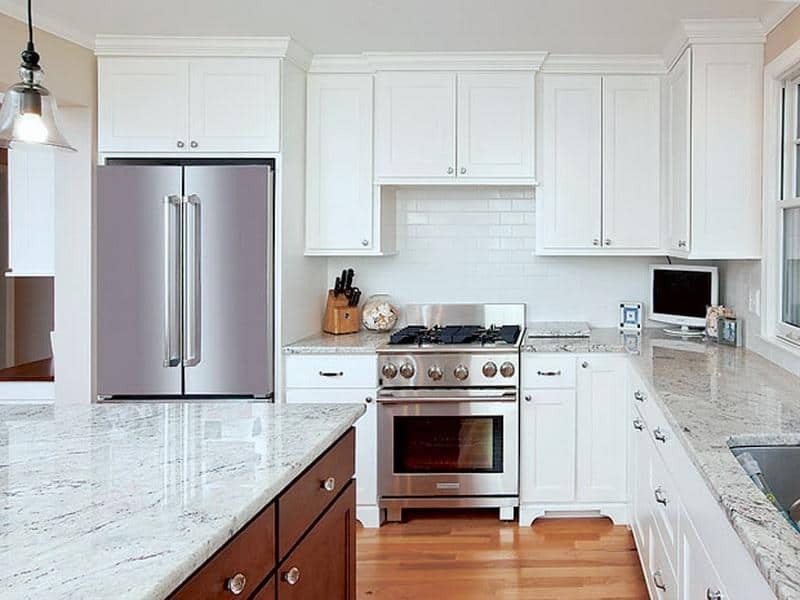 However, if you have a small kitchen you know, having mostly silver appliances can actually take over the room. Making it appear smaller than what it already is. That is when black appliances have come back on trend. More and more appliance companies have welcomed this trend and are creating black appliances from stove tops to sinks and even refrigerators. Make your kitchen truly feel yours with your very own special touches. Kitchens are considered the heart of a home and for good reason. They are the most used rooms in a house. Therefore, this trend calls for you to add your very own personal touch such as different towels or even frames and images that you enjoy. 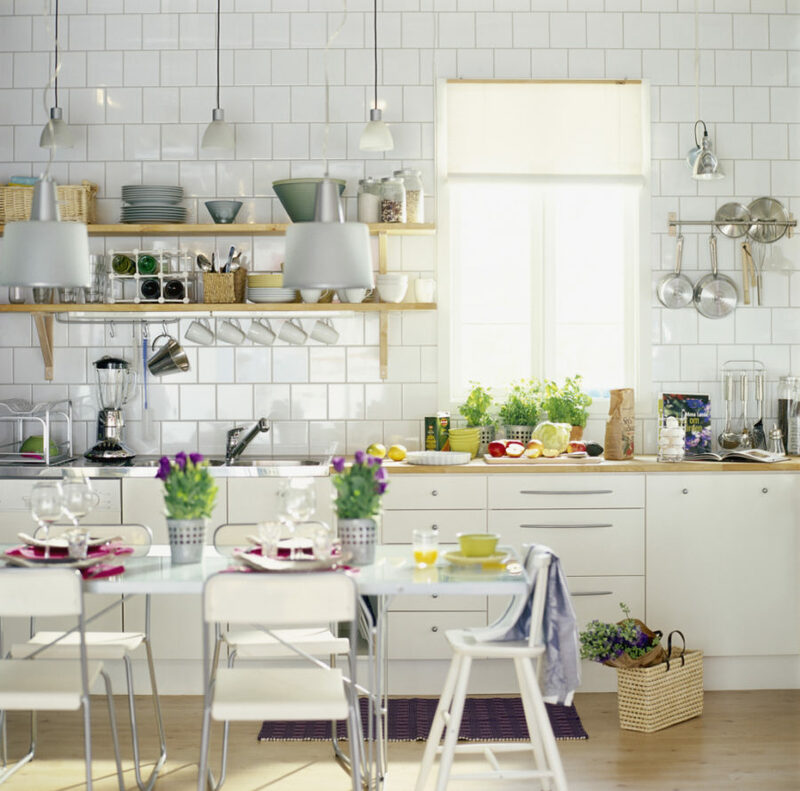 The key is to make the kitchen appear less “magazine kitchen” and more at “home kitchen”. Add pops of color in your kitchen with your sink. Just like kitchen walls are changing from white so are sinks. 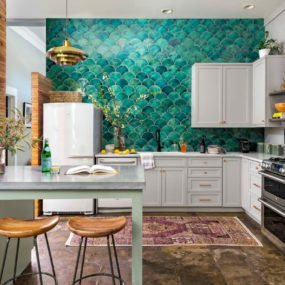 If you are interested in adding a pop of color to your kitchen without disrupting your existing décor changing the color of your skin to a fresh tone is the way to go. 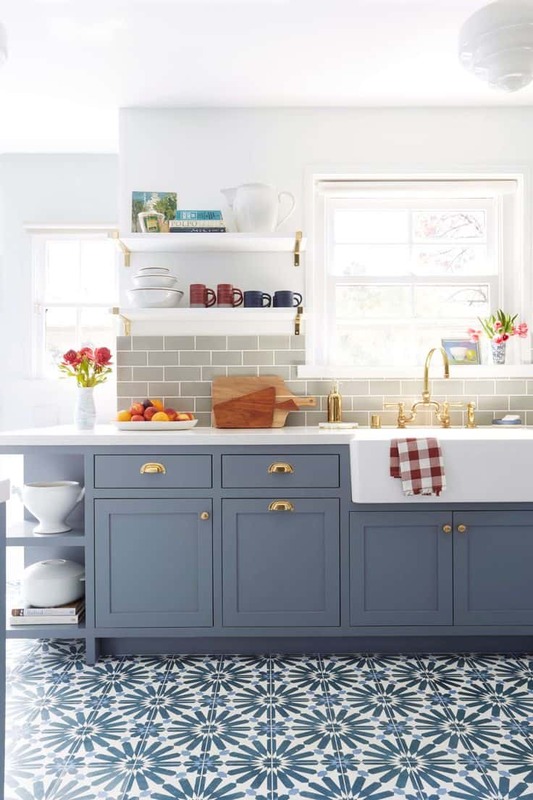 This trend is fairly new but we are already obsessed with the idea of having a different colored sink. Granite counter tops have always been the normal and usual. However, granite is moving over and giving quartz the spotlight. 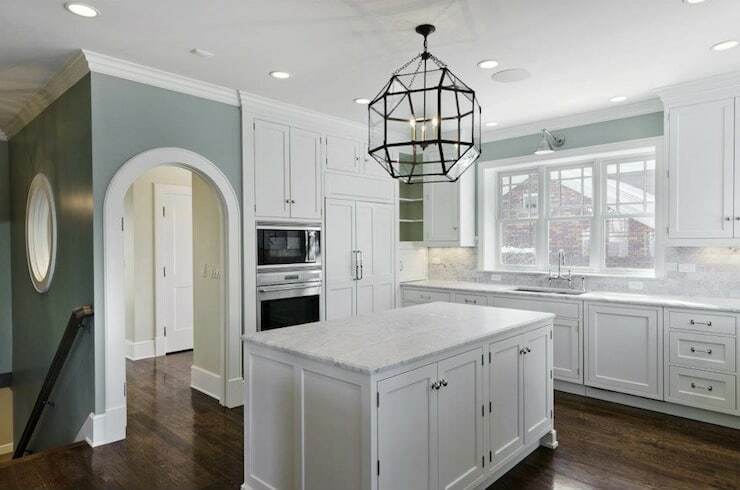 Quartz is very similar to granite, but it does have a more modern appearance which can appeal to many homeowners who want to try something new in their kitchen décor. У нашей фирмы классный веб сайт со статьями про https://proffitness.com.ua.